ANCIENT JEW REVIEW: Dissertation Spotlight | Jessica Dello Russo. Jessica Dello Russo, "Jewish Shadows of Subterranean Christian Rome," Ph.D. dissertation, Pontifical Institute of Christian Archaeology, 2017. My research for the doctorate from the Vatican’s Pontifical Institute for Christian Archaeology concentrates on the material testimony and modern discovery accounts of burials dating to the Ancient Roman era. Whether for reasons of context or content these tombs are identified as belonging to Jews. My work spans many centuries of scholarship on different types of archaeological finds. What really interests me is this: from the two types of data, literary and archaeological, what are the “essential differences”, if any, between Jewish and contemporaneous non-Jewish, notably Christian, burial arrangements and tomb monuments? Past PaleoJudaica posts on the Roman Jewish catacombs are here and links. REVIEWS OF THE ENOCH SEMINAR: Laura Lieber reviews My Perfect One: Typology and Early Rabbinic Interpretation of the Song of Songs (Jonathan Kaplan). Jonathan Kaplan, My Perfect One: Typology and Early Rabbinic Interpretation of the Song of Songs. Oxford: Oxford University Press, 2015. ISBN: 978-0199359332. Pp. 245. $74.00 cloth/ebook. Most of the most readily accessible and familiar early Jewish interpretations of the Song of Songs—notably Song of Songs Rabbah (the major midrash explicating the Song) and the Targum (Aramaic version) of the Song—significantly postdate the Tannaitic material studied by Kaplan. Songs Rabbah is often dated to around the fifth century CE (although it surely contains earlier material) while the Targum is likely from the seventh century CE. In their received form, these works offer verse-by-verse commentaries on the Song, as do a number of late antique liturgical poems composed for use during Passover. The Tannaitic readings of the Song explored by Kaplan are, by contrast, episodic and occasional, and they cluster in the midrashic sources around specifically evocative sources from the Torah, such as the Song at the Sea (Exod 15). Kaplan’s analysis culls and organizes these deployments of the Song along thematic lines. Archaeologically we know that pigeon-rearing was already well established on the southern coastal plains of the Levant by the Hellenistic period. Hundreds of hewn underground installations date to this period and there are also many structures from the Roman and Byzantine Periods all over the region. Pigeon structures have been identified in archaeological contexts at Jericho, Jerusalem, Masada, Herodium, and Petra, to name a few. A newly discovered dovecote at ‘Ain al-Baida/‘Amman in Jordan, dating to the Iron Age, may help date other regional dovecotes to earlier periods than originally assumed. An excellent example of pictorial evidence dated to 100 BCE comes from a scene on the Palestrina mosaic located east of Rome at the sanctuary of Fortuna Primagenia. The mosaic illustrates landscape scenes along the Nile and includes an often overlooked example of a pigeon tower. And there's also that Masada miniseries, "The Dovekeepers." Plus much else of interest in this essay. 'TIS THE SEASON: Apocryphal text sheds light on Wise Men story (Courtney Sosnowski, Baylor Lariat). Many people, Christian or not, could tell you about the three wise men who followed a star from the east and presented the baby Jesus with gold, frankincense and myrrh. The lecture addressed the apocryphal text, “The Revelation of the Magi,” which gives the Magi’s account of the events surrounding Jesus’ birth. The Revelation of the Magi, a Syriac apocryphal New Testament text that was published a few years ago by Dr. Landau, has become a fixture in Christmas-Season media stories. Deservedly so: it's a great text, even though it tells us nothing about the historical Magi or the birth of Jesus. Past PaleoJudaica posts on it are here and links and here. For those following the affair, Shapira’s death at the age of 54 seemed to be the sad end of his story. But fast forward more than 60 years to the discovery of the Dead Sea Scrolls, thousands of ancient biblical scrolls and scroll fragments first uncovered in 1947. Shapira’s Deuteronomy was said to have been stashed away in a cave. So, too, were the Dead Sea Scrolls. Shapira’s manuscript was full of interesting departures from the traditional Bible text. So, too, were the Dead Sea Scrolls. 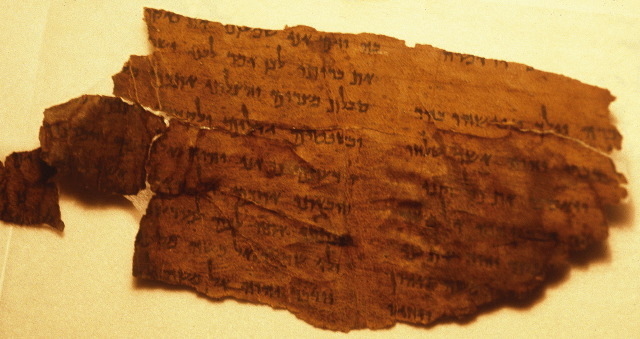 Shapira’s text was found by Bedouin wandering the deserts near the Dead Sea. So, too, were the Dead Sea Scrolls. The similarities were too striking to dismiss. Beginning in the 1950s, a number of scholars decided to return to Shapira’s manuscript, using methods not available to Ginsburg in 1883, to prove once and for all whether it was real or fake. But there was a problem: Shapira’s scrolls had mysteriously vanished. Mr. Tigay's adventures are both entertaining and informative, so take some time to sit down and read the whole article. It contains some revelations that I have not seen before. As for the rhetorical question in the headline: on the one hand, it has recently been argued in a peer-review journal article that the Shapira scroll was a genuine ancient artifact. On the other hand, Mr. Tigay has uncovered some striking circumstantial evidence that points pretty strongly in a different direction. Again, read it all. For more on his book, start with the latter link and follow the links from there. BEYOND THE PALACE HEMI-POWERED DRONES SCREAM DOWN THE BOULEVARD: Drone Spots 2,200-year-old Edomite Temple in Israeli Live-fire Zone. The temple, or it may have been a palace, had been burned down by Jewish forces who conquered the region, converted surviving locals and built ritual baths (Ruth Schuster and Nir Hasson, Haaretz). Archaeologists using drones have found what seems to be a rare Edomite temple dating to 2,200 years ago, smack in the middle of a live-fire zone. The structure seems to have been destroyed by Jewish forces, possibly under Judah Maccabee himself, who then converted the surviving locals. The structure could be a temple, or a palace, and in any case seems to have been destroyed in one of the incessant upheavals of the region. In this case, the building, evidently a large one, may have been destroyed during the Hasmonean conquest of the region in 112 B.C.E. Following the Hasmonean victory, the locals were forced to convert to Judaism. The structure was found on a hill at Horvat 'Amuda, in the Lachish region. After decades of being barred from the site because of its use for military training, excavation commenced a couple of months ago and uncovered this structure, from the Hellenistic period. With apologies to Bruce Springsteen. Couldn't resist. Seriously, this sounds like an extraordinarily important discovery which may tell us a lot about the Edomites/Idumeans. Cross-file under Archaeology. APPREHENDED: Four Arrested in Turkey for Stealing 700-Year Old Torah Scroll (Sputnik News). Four people were arrested in Turkey last week after attempting to sell an ancient Torah scroll to undercover police officers for almost $2 million. The Torah, the holiest book in Judaism, contains the entire Hebrew text of the Five Books of Moses and is read aloud in all synagogues. The one recently recovered in Turkey is believed to be 700 years old. It's possible that they had a 700-year-old Torah scroll, but I am skeptical of all details of the story until I see some independent verification. I note it because in recent years there have been many stories about supposedly-ancient Jewish artifacts being seized from smugglers in Turkey. I like to keep track of these. I have collected my past posts here (follow-ups here and here). Often the claims about the artifacts have seemed dubious. This case is one of the more plausible stories, although the asking price strikes me as awfully high. Again, well done to the Turkish authorities for all their efforts against antiquities smuggling. The photo at the top of the article is not of the Torah scroll in question. It is of a printed volume and the text isn't even the Pentateuch. UPDATE: Reader Roberto Labanti points us to this Daily Sabah article, which has photos of what is reported to be this Torah manuscript: 700-year-old Torah seized in Turkey's Muğla. It is written in gold ink (cf. here, here and here). The first and third image are upside-down, but I can make out enough of the text to see that it isn't a Torah text. It has more recent Hebrew forms in it. Also, it isn't nearly big enough to be a complete Torah scroll. I don't know what it is, but I very much doubt that it is worth $1.9 million. The fragment touted by Carroll and others as part of a first-century version of the Gospel of Mark remains unpublished. Only a handful of people have claimed to have seen it, and many in the scholarly world doubt that it exists, though Green declares that he had authorized its purchase. The claim that it was discovered in a mummy mask has since been walked back. And while until recently the Museum of the Bible’s website still referred to the potential for discovering biblical texts in mummy masks, current and recent employees have told us that the practice of purchasing and dismantling these artifacts is no longer part of the museum’s practice. What, then, of McDowell’s remarkable discoveries? In a fundraising document written in the wake of the Discover the Evidence event, McDowell describes how Carroll had extracted papyri from the cartonnage and found seven biblical texts. McDowell even provides images of the fragments: they are from fourth-century manuscripts of Matthew, Mark, John, and Galatians, and a fifth-century text of Jeremiah. What he does not make clear, however, is that none of these fragments actually came from the two mummy masks that Carroll dissolved that day. They came, rather, from cartonnage used in book bindings from centuries later. (It is not even clear that these texts are what Carroll and McDowell purport them to be. A specialist in papyrology has questioned both the dates assigned to the manuscripts and their identification.) What did come out of McDowell’s mummy masks was exactly what one would ex­pect from Ptolemaic Egypt: economic texts, letters, and burial documents. Carroll told us, “I can only say I know what I’ve seen.” No one else has seen the materials, though. And to date, not a single Christian text has been published, formally or informally, that has come from a mummy mask. More on the mummy masks and the Palmolive soap is here and links. And for more on that report of a first-century manuscript of the Gospel of Mark, see here and links. And for background on the Museum of the Bible, Hobby Lobby, and the Green Collection, start here and follow the many links. ARCHAEOLOGY: Hidden hoard hints at how ancient elites protected the family treasures. A find from Israel reveals clues about Iron Age wealth protection (Bruce Bower, Science News). BOSTON — Long before anyone opened a bank account or rented a safe deposit box, wealth protection demanded a bit of guile and a broken beer jug. A 3,100-year-old jewelry stash was discovered in just such a vessel, unearthed from an ancient settlement in Israel called Megiddo in 2010. Now the find is providing clues to how affluent folk hoarded their valuables at a time when fortunes rested on fancy metalwork, not money. This is outside PaleoJudaica's usual range, but a detail of this story caught my eye. This jewelry hoard from about 1100 BCE Megiddo was wrapped in two linen cloths and the linen cloths still survived. You can see them wadded up in the photo. They aren't in great shape, but they are there. So some textiles that had been hidden in a jar survived for 3000 years. Regular readers will see where I am going with this. The implication is that if someone in the time of the United Monarchy had sealed up some scrolls in a jar (like some of the Dead Sea Scrolls) in the region of Megiddo, they would have had a reasonable chance of surviving to the present. This and the evidence from the Timna Valley excavation give us some hope that someday we may find inscribed scroll fragments from the time of the United Monarchy, or even a bit earlier. If someone hid them in jars, they could still be there. We have no way of know whether such scrolls were hidden, but there is clear evidence that if they were, their survival to the present is within the realm of possibility. Let's just keep that in mind. Such deficiencies in argument, when taken together with other blunders that dilute the book-its unnecessary length and murky structure, its numerous typos, the author's flimsy, usually second-hand knowledge of Hebrew and/or Aramaic, the spoken vernacular of one of the major groups of people he is studying, and his limited acquaintance with other literatures of the time that provide insight into the events he is studying, such as the Qumran and rabbinic corpuses-all undermine the validity of this work. Those well-trained in the history of the revolt will find value in the questions Mason raises and in his provocative suggestions, even if only to reject them. Others, seeking a good and thorough presentation of this key moment in ancient history, will have to await for future, or revert to earlier, more solid discussions by others. An earlier, and more positive, review of the book was noted here. NEW BOOK FROM URIM PUBLICATIONS: From Forbidden Fruit to Milk and Honey: A Commentary on Food in the Torah by Diana Lipton. Food is at the heart of Jewish life and culture as the subject of many recent studies - popular and academic - and countless Jewish jokes. From Forbidden Fruit to Milk and Honey spotlights food in the Torah – where it’s used to explore such themes as love and compassion, commitment, character, justice, belonging and exclusion, deception, and life and death. Originally created as an online project to support the innovative food rescue charity, Leket Israel, From Forbidden Fruit to Milk and Honey comprises short essays on food and eating in the parasha by 52 internationally acclaimed scholars and Jewish educators and a commentary by Diana Lipton. Proceeds from sales of this book will go to Leket Israel. Follow the link for the TOC and ordering information. Glory formed an essential part of early Christianity's christological vocabulary. Along with "word", "image" and "wisdom" Glory (doxa) language worked to define the identity, status, and even uniqueness of Christian belief in Jesus. In this book Carey C Newman, using methodology developed in semantics, semiotics, and literary theory, examines the origin and rhetoric of Paul's Glory-language. Newman divides the investigation into three distinct tasks: (1) to plot the tradition -- history of Glory that formed part of Paul's linguistic world, (2) to examine Paul's letters, in light of the reconstructed tradition -- history of Glory, in order to discern the rationale of Paul's identification of Christ as Glory, and (3) to map out the implications of such an identification for Paul's theological and rhetorical strategy. Newman reaches four conclusions for understanding Paul. First, Paul inherited a symbolic universe with signs already full of signification. Second, awareness of the connotative range of a surface symbol aids in discerning Paul's precise contingent strategy. Third, knowing a symbol's referential power defines and contributes to the deeper structure of Paul's theological grammar. Finally, the heuristic power within the construals of the Glory tradition coalesce in Paul's Christophany and thus provide coherence at the deepest level of Paul's Christology. Taken together, these conclusions reveal that nothing less than Paul's declaration of Jesus as God is expressed in his designation of Jesus as Glory. Another in Baylor's new Library of Early Christology reprint series, on which more here and links. PROJECT: Alison Schofield Tackles New Translation of the Dead Sea Scrolls. DU professor is one of three editors on an international project (Jon Stone, University of Denver). Alison Schofield is truly living her childhood dream. An associate professor of religious and Judaic studies, she works with some of the most intriguing ancient manuscripts in Judaism and Christianity. Schofield joins Daniel Falk of Penn State University and retired professor Martin Abegg Jr. of Trinity Western University in piecing together the fragments, creating a translation and providing textual notes and commentary to help readers make sense of all the different copies of the scrolls. MATERIAL CULTURE: Mortar Found in 'Tomb of Jesus' Cave Dates to Constantine Era One mystery surrounding the tomb had been the origin and date of the marble slab at the bottom of the Church of the Holy Sepulchre (Haaretz). Mortar found in the limestone cave at the bottom of the Church of the Holy Sepulchre in Jerusalem has been dated to the time of Emperor Constantine, who reigned in the 4th century C.E., National Geographic reported on Tuesday. Chemical tests of the mortar between the limestone and the marble slab covering the purported tomb date it to around 345 C.E., NatGeo reports. It certainly could be the tomb found by envoys of Emperor Constantine and the Holy Roman Empire around 20 years earlier. There is no archaeological evidence whatsoever for the existence of Jesus, let alone for the identity of the person who might have been buried in that cave, if any. I wouldn't expect much in the way of direct archaeological evidence for the existence of a first-century Palestinian itinerant healer. But there is plenty of textual evidence. What we can say about the historical Jesus which goes beyond his mere existence is, of course, a matter of considerable debate. Likewise, we have no way of being sure who was buried in this tomb. The really interesting thing from an archaeological perspective is that it does seem to be a first-century tomb. More on the recent repairs at the Church of the Holy Sepulcher (Holy Sepulchre) is here and links (cf. here. PHOENICIAN WATCH: Homesick Phoenicians Imported Plants, Animals to New Sicilian Island Home 3,000 Years Ago. DNA analysis of seeds and bones unearthed on the tiny island of Motya show that they came from the ancient Levant, brought by the Phoenicians to Sicily (Philippe Bohstrom, Haaretz). Over 3,000 years ago, as the Phoenicians spread west from the Levantine coasts of the Mediterranean to Sicily and beyond, it turns out they had not only animals on board, but plants and tableware too, bringing with them the taste of home. Archaeologists excavating a village the seafaring Phoenicians established on the tiny island of Motya, on the western tip of Sicily, found plant seeds and animal bones that they had brought from home, possibly the coast of today's Lebanon. The Phoenicians seem to have first landed on Motya, an island with protected anchorage and with access to mainland agriculture, sometime in the 10th to 11th century B.C.E. By the late 9th century B.C.E., they had developed it into a proper colony, thanks to no small part to the safe harbor. Pottery and inscriptions to their gods, among other things, seal the case that the town was Phoenician. There are many interesting finds at this site. Cross-file under Archaeology and Material Culture. THIS WEEK'S DAF YOMI COLUMN BY ADAM KIRSCH IN TABLET: To Flog or Not to Flog. Which sinners are to taste the lash, how many strokes of it, in what circumstances, with what intention, and as just punishment in which cases, and with what exceptions: As always, the Talmud leaves no contingency unaccounted for. ANCIENT JEW REVIEW: Book Note | Valuing the past in the Greco-Roman World (Kelsi Morrison-Atkins). James Ker and Christoph Pieper, eds. Valuing the past in the Greco-Roman World: Proceedings from the Penn-Leiden Colloquia on Ancient Values VII. Leiden: Brill, 2014. Valuing the Past in the Greco-Roman World asks how the past was defined, accessed, and valued in that period of time so often considered “our” antiquity (18) and provides an array of fascinating examples that work together to undercut notions of the value of the past in the past as in any way uniform or monolithic. This range of historical perspectives calls for further reflection on the ethics and politics underlying our own individual and institutional practices of valuing the past in the present and contributes much to our understanding of the range of values ascribed to the past in the past. EXHIBITION: Ancient hidden texts from St Catherine’s Monastery in Mt Sinai displayed in Athens (video) (Tornos News). Ancient texts from St Catherine’s Monastery in Sinai, Egypt, that were kept secret for centuries under other texts until they were revealed through the use of state-of-the-art technology will go on display for four days starting on Monday at the Greek Foreign Ministry. The texts will be showcased as part of an international conference titled “The Other Voice of the Desert: The palimpsest manuscripts of the Sinai Monastery, new technologies for reading, discovery of unknown texts, prospects for research,” at the ministry’s Yiannos Kranidiotis Auditorium. For more on the palimpsests from St. Catherine's Monastery, see here and links. EVENT: Professor unearths Israeli heritage (The Pitt News). Pitt’s Jewish Studies program and Nationality Rooms program came together Monday night to host [Professor Jodi] Magness and celebrate the 30th anniversary of the Israel Heritage Classroom — the 20th Nationality Room constructed in the Cathedral. More on Professor Magness is here and links. This article could have mentioned that she also has a Ph.D. in Classical Archaeology from the University of Pennsylvania. For past PaleoJudaica posts on Huqoq and its mosaics, start here and follow the links. PALMYRA WATCH: DUBAI COMBATS ISIS DESTRUCTION WITH 3D PRINTED ARTEFACT RECONSTRUCTIONS AT UN HQ (Rushabh Haria, 3D Printing Industry). When the Islamic State in Iraq and Syria (ISIS) wreaked havoc across regions of Syria and Iraq, they also destroyed countless Assyrian, Greek and Roman artefacts in museums and on site. In an effort to preserve the cultural heritage and archaeological sites of the region, institutes such as the Dubai Future Foundation (DFF) are 3D printing some of the destroyed objects. Some of the foundation’s work is to be displayed at the “The Spirit in the Stone” digital archaeology exhibition at the UN New York headquarters, inaugurated this week. The printed objects include the Arch of Triumph and a statue of Athena. More on the replicas of the Arch of Triumph is here and links. Related post here. For many other past posts on the site of Palmyra, its Aramaic language, its artifacts, and its tragic fate while in the hands of ISIS, start here and follow the links. Cross-file under Technology Watch. BRYN MAYR CLASSICAL REVIEW: Laura Carrara, Mischa Meier, Christine Radtki-Jansen (ed. ), Die Weltchronik des Johannes Malalas: Quellenfragen. Malalas-Studien, 2. Stuttgart: Franz Steiner Verlag, 2017. Pp. 409. ISBN 9783515116442. €68.00. Reviewed by Geoffrey Greatrex, University of Ottawa (greatrex@uottawa.ca). The first two chapters consider the early books of Malalas, in which myths and history are blended into a euhemerising account of early times. Both articles, by William Adler and Umberto Roberto, emphasise Malalas’ debt to Julius Africanus, direct and indirect; they both also discuss his use of traditions found in the Book of Jubilees. Each article has interesting things to say about Malalas’ adaptation of this material, making it more Roman, but it is puzzling how little cross-referencing there is between them, especially since they cover such similar ground (e.g., at 34-5, 58-9). The sixth-century chronographer Malalas makes use of other ancient Jewish sources as well, directly or indirectly. And I have mentioned before that he preserves an alternative account of the Maccabean Revolt which may give a Seleucid perspective. (MODERN) NEW TESTAMENT APOCRYPHA WATCH: Real 'Book of Judas' inspires journalist's novel (Rev. Alexander Santora, Jersey Journal/nj.com). [Linda Stasi's] sixth book and second novel, "Book of Judas," manages to display her wicked use of words wrapped around a gospel few of us ever heard of, "The Gospel of Judas," a Gnostic gospel that has seen renewed interest over the last decade. The article displays an outdated understanding of the Gospel of Judas. Hopefully the novel does not, but its hard to tell. Past posts on the Gospel of Judas are here and follow the many links. THE AWOL BLOG: Preisendanz, Papyri Graecae Magicae. All three volumes of Preisendanz's edition of the Greek Magical Papyri are now online for free. They can be downloaded as PDF files. TECHNOLOGY WATCH: Life-size relief replica stars in Arch of Titus show in New York. Massachusetts sign carver uses 3-D scans and and hi-tech machinery to make striking copy of famous 'Spoils of Jerusalem' bas-relief (Renee Ghert-Zand, Times of Israel). Lindsay Neathawk first saw the Arch of Titus on a visit to Rome in 1998. A teenager at the time, she could not have imagined that two decades later she would make the first hi-tech replica of the ancient monument’s famous “Spoils of Jerusalem” panel commemorating Roman forces’s capture of Jerusalem and destruction of the Holy Temple in 70 CE. Using cutting-edge digital tools, Neathawk, a graphic designer and owner of a sign carving business in Williamstown, Massachusetts, spent a straight 49 days last summer creating the replica. It was carefully transported in late August to New York City, becoming the centerpiece of the current “The Arch of Titus – from Jerusalem to Rome, and Back” exhibition at Yeshiva University Museum. Background on the Arch of Titus exhibition at YU is here and links. Follow the links from there also for many past posts on the Arch of Titus itself. I've also been following the story of the 3-D replicas of the Arch of Triumph from Palmyra (also known - incorrectly! - as the portal of Baal). See here and links. TC: A JOURNAL OF BIBLICAL TEXTUAL CRITICISM (VOLUME 22, 2017) is now out, with lots of biblical text-critical goodness. REVIEW OF A NEW BOOK FROM THE UNIVERSITY OF PENNSYLVANIA PRESS: The brothers Maimonides. New book shines light on the relationship between law, business, and family (Larry Yudelson, Jewish Standard/Times of Israel). This saga had an impact on Jewish law, Dr. Mark R. Cohen argues. Dr. Cohen, professor emeritus at Princeton, is an expert on the Cairo Geniza. That’s the hoard of a thousand years worth of old books, letters, and contracts that provides a unique window on Jewish life in the Middle Ages. Among its treasures are letters between the Maimonides brothers. His most recent book, “Maimonides and the Merchants,” zooms in on the legal rulings of Moses Maimonides, as he is known in English — or Rambam, which is short for Rav Moshe ben Maimon, his Hebrew name — and in particular on how he modified talmudic commercial law to account for the way international business worked in the twelfth century. For more on the book, see here. For many, many past posts on the Cario Geniza, start here and here and follow the links. READING RELIGION: The Samaritans. A Profile (Matthew Chalmers). Cambridge, UK: Wm. B. Eerdmans Publishing Co., February 2016. 376 pages. $30.00.Paperback. ISBN 9780802867681. For other formats: Link to Publisher's Website. The Samaritans is the book which the study of the Samaritans needed. It distils an unwieldly mass of scholarship into a concise, accessible form. Where there are omissions, they indicate fertile ground yet to explore, rather than any failure on the part of Pummer. In The Samaritans, one of the most erudite scholars of Samaritanism has given to us—scholars researching Samaritans like myself, scholars with general interests, and a reading public to whom the Samaritans are a fuzzy but fascinating overheard name—a wide-ranging, clear, and perhaps most importantly, intellectually generous overview. HT AJR. Past PaleoJudaica posts on the book are here and here.